Take a closer look at the new combos, customizations, and story twists that subvert expectations. Beautiful, but oh so brutal, Mortal Kombat 11 deals out bone-snapping, wince-inducing strikes with the speed and ferocity of a card shark. The detail (and sheer inventiveness) of the fatalities will cause you to flinch, but equally you’ll feel the conviction of a fighter’s intent in their facial expressions alone. Take Sub-Zero’s ice-cold fury at meeting old foe Scorpion in their match-up intro, for example. Even with the mask covering half his face, it had us catching our breath. Mortal Kombat was always a genre heavyweight graphically, but every inch of MK11 — character movement, those heavily-detailed stage backdrops, even loading screens — pack an inarguable level of polish that deserves to be appreciated. There’s plenty fresh with MK11: new combatants who fit flawlessly into the ever-expanding mythos, reinvigorated move-sets, refined systems, additional modes. MK11 feels like the product of teachings learned not just from its predecessors but the critically-acclaimed Injustice 2. But for a title that’s so intent on not coasting on past glories in terms of mechanics, it is a game that has a thematic fixation with time. Both to its manipulation and in context of the franchise’s history. MK11 is a continuation of a story beat that was core to the 2011 series’ reboot. There, the story told across the 1992 original and its two sequels was changed due to a warning sent back through time to Raiden. The message came from a future version of himself, in the hope that foreknowledge would alter events and prevent his defeat at a later date. Subsequently characters, events and more were changed — but not all for the better. The reexamination of the series’ 26-year history could be a compelling hook for longtime fans. Imagine Looper with martial arts rather than bullets. Or a gory spin on Back to the Future. Time manipulation bleeds into gameplay, too. Newcomer Geras can tamper with time as part of his move set. Learn him and you’ll be able to undo damage by rewinding a few seconds, resurrect yourself or subtract seconds off the round timer. It’ll be fascinating to witness two pro-players who’ve fully come to grips with his potential. And that’s the great thing about Mortal Kombat 11. If you’re not concerned with its story and character politics, you can just enjoy its highly polished fighting mechanics. NetherRealm Studios is clearly not content on incremental updates. Even on first hands-on, Mortal Kombat 11 is a different beast from its predecessor. Combo focus seems to be weighed towards shorter, more brutish displays of power (and muscle memory) that arguably feel welcomingly old-school compared to the lengthy juggle strings of MKX. As for special moves, Scorpion’s yo-yo-like spear twirling, Sub-Zero’s ice shuriken and axe are early highlights. 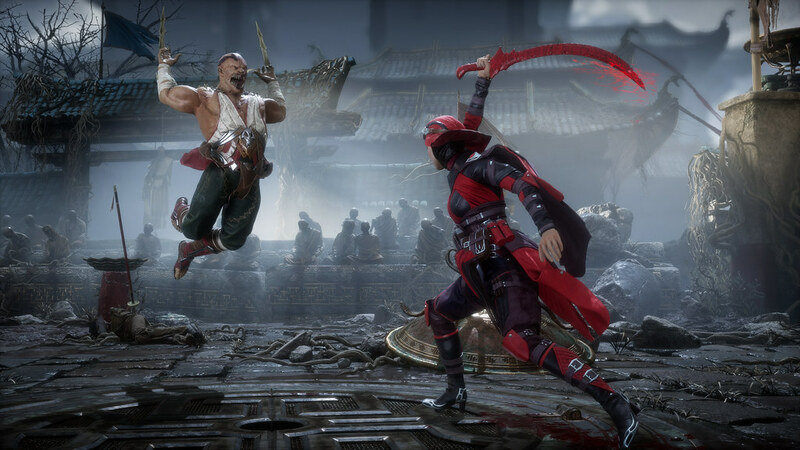 From a purely visual standpoint, the creativity behind Skarlet’s weaponized blood and the fearsome, new-gen look to returning fan-favorite Baraka promise plenty of new showstopper combos. Even the classics get an overhaul: Raiden’s famous ‘superman’ can be stalled on deployment. Let the mind-games begin. Character customization is a major new advancement seemingly influenced by Injustice 2, fusing aesthetic preference with moveset partiality to better tailor your MK main to your preferred fight style. Couple that with collectable attribute points to spend as you wish to shape the strengths of your chosen kombatant, the degree of variation and gameplay depth increases massively. Mortal Kombat 11 seems eager to bring something different to a genre it’s helped define over two decades. “Change… I always feel like changing the game up is important,” says Ed Boon when asked about the franchise’s longevity, suggesting it is a careful balance of the old and new. Of taking a fresh approach to the best history has to offer. I’ve enjoyed Injustice 2 at length, and this seems very promising. I’ve seen some of the Fatalities; they’re very gruesome but creative. I just might pick this up for the customization alone. So excited for this game! I love that they started releasing them around 4/20. They know their audience. I’m revisiting mkx on my yt channel the next couple mondays, look up Crazednormalcy, shameless plug lol. To hear the fact that MK1 MK2 MK3 are you basically going to be a part of this storyline makes me super ecstatic. I left the Mortal Kombat game in MK3. Came back and mk10 interested to see how the story plays out. I still feel giddy every I think of it release. This game looks like it will be amazing. I had the privilege to be one of the first to test it during the London reveal, and loved every second of it. In a lot of recent cases Sony is the one that has been saying no to developers, and the rumor mill for MK11 also is leaning in that direction. Could you guys give any additional insight? Is this being worked on, or even already cleared up? I love being part of the platform that is "For the Players", but would hate to be left out in the smallest community due to a corporate seemingly outdated stance on cross-platform. We know you can do it, as shown with Fortnite! To echo the previous comment on here: as an event organizer in a smaller community, crossplay would be a huge deal for us. Please consider adding this to the product (preferably at launch, if that’s not possible at least in a future update). Crossplay is one of the biggest contributors to a title’s long-term health. Longer lifespan means more players, and ultimately: more sales. I’m glad they are dialing back the combat to be less juggling-centric. I really enjoyed all the games before MK9 for this reason. I think I am going to get back into MK with this entry!! I’m really conflicted about the models. They just look odd compared to other releases. I can’t quite figure it out but they just look out of place for some reason, almost too shiny and kind of “plasticy” Like they were all modeled after Johnny Cage’s hollywood makeover lol.. Hopefully they’ll improve once the game comes around to finalization. Also.. when the heck are we going to get some GWAR action in Mortal Kombat?! This needs to happen! So Sony…Are you guys going to continue to support the game you partially funded Street Fighter V? The updates have been getting slower and it would seem odd to let the flagship FGC game just stagnante.